Risk models only have value if they are used effectively in combination with a limit management and control process for setting risk limits for counterparty exposure and trading positions. While a control function requires and relies on reports, the key is not generation of quantitative numbers, formatted in ten different variations and cuts; it is the interpretation and application of that analysis that matters. The objective of a risk function is to not just gather data, run reports, submit and analyze them; it is to ensure that unpleasant surprises and their impacts are limited. While you can’t control the timing and magnitude of such surprises, a well managed and well run risk function can help manage expectations as well as plan ahead for unexpected shocks. Such a not function focuses on not just setting risk limits but also updates and modifies the limits structure based on market conditions. The ability to work with a responsive structure has multiple benefits compared to a rigid locked in for a year framework. If your dealing with a given counterparty in a given currency routinely crosses 1M USD per day, setting a limit below or at that threshold will create more problems than it will solve. Depending on your risk appetite, your assessment of counterparty credit risk and your comfort with currency volatility and settlement risk you can add anywhere between 10% to 30% of margin to your baseline threshold. This ensures that routine exposures do not trigger counterparty risk limits exceptions and only significant changes to that baseline will lead to a review. Volatility or volatility driven measures such as Pre Settlement Risk (PSR) and Potential Future Exposure (PFE) for counterparty risk. Volatility, VaR, Conditional VaR, Capital and Earnings at Risk and Stop Loss based measures for trading positions. This implies that changing risk conditions would also lead to changes in the limit structure. Higher volatility would lead to a tightening of the limit structure and lower volatility levels would loosen the limits available. Limits should be fungible at lower levels. The trader should be allowed to take risks to exploit the best opportunities available without being too tightly bound by a complex rigid multi layered limit system. Similarly a senior trader should be allowed to move limits from one subordinate desk to another. Same application of the margin rule from counterparty exposure above. Routine activity should not trigger risk limits. Limits should be portable across desks, currencies and exposures. Both hard and soft limits need to be set. If the limit is hard then traders know that they will be disciplined or fired for violating the limit. If the limit is soft a violation simply leads to documentation, exception reporting and a conversation where the trader is advised to reduce the position. 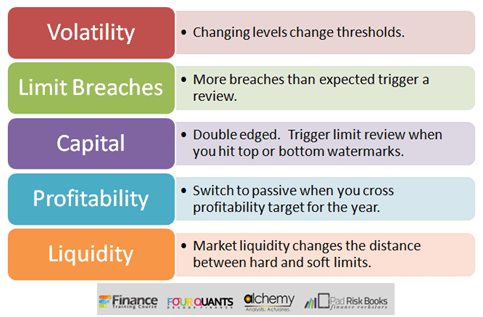 The Limit framework relies on both operational (stop loss, action trigger), transactional (position, dealer, desk, product) and counterparty credit limits. In our new course on setting risk limits, we take a look at all three. See process of setting, reviewing and linking limits including VaR, Stop Loss, PSR, Margin and Counterparty limits based on market volatilities.